It's the moment every gardener dreads - you walk out to enjoy your beautiful garden and are met by plants that have been so chewed up that they are unrecognizable. 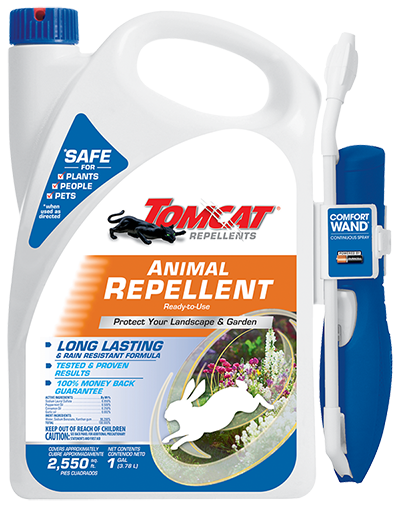 Tomcat® Repellents Animal Repellent Ready-To-Use protects your landscape and garden from this greenery assault. The smell and taste of Tomcat® Repellents Animal Repellent Ready-To-Use is unpleasant to animals like rabbits, squirrels and groundhogs. Its long lasting, rain resistant formula is safe to use on edible fruits and vegetables as well as around people and pets when used as directed. 24 oz. container will treat approximately 450 sq. ft.; 1 gallon container will treat approximately 2,550 sq. ft. Shake container well before using. Product is ready to use and does not need to be mixed or diluted. Spray plant leaves, stems, flowers, edibles, and branches that need protection, making sure plants are covered. For extra protection on low growing plants, spray soil around plant base as well. Allow 30 minutes for this product to dry before watering of any kind. Watering at the root is recommended to extend repellency longevity. This product should only be applied around plants which do not grow above a height of 18 in. Repeat application every 30 days, at first sight of new damage, or new plant growth. More frequent application may be required after periods of heavy rainfall and if more damage is noticed. Tested and proven results. 100% satisfaction guaranteed or your money back! 100% Money Back Guarantee: If for any reason you, the consumer, are not satisfied with this product, mail us your original proof of purchase to obtain a full refund of your purchase price. When finished with contents, offer for recycling or dispose according to local or municipal laws. Never place unused product down any indoor or outdoor drain. Safe for use around people and pets when used as directed. Allow 30 minutes for this product to dry before watering of any kind. Watering at the root is recommended to extend repellency longevity. Ready-to-Use spray that repels deer and rabbits. No mixing or dilution needed. Repel rabbits, groundhogs, squirrels, and other small animals with this granule formula. Just shake and say goodbye to unwelcome landscape and garden visitors. © 2002-2019 The Scotts Company LLC, all rights reserved. ® & ™ denote trademarks owned by or licensed to The Scotts Company LLC, its affiliates, or partners.